In my last entry I gave some background about how my wife and I came to the decision to move back into the funeral home. I’d like to tell you a little bit about where I am in that project. 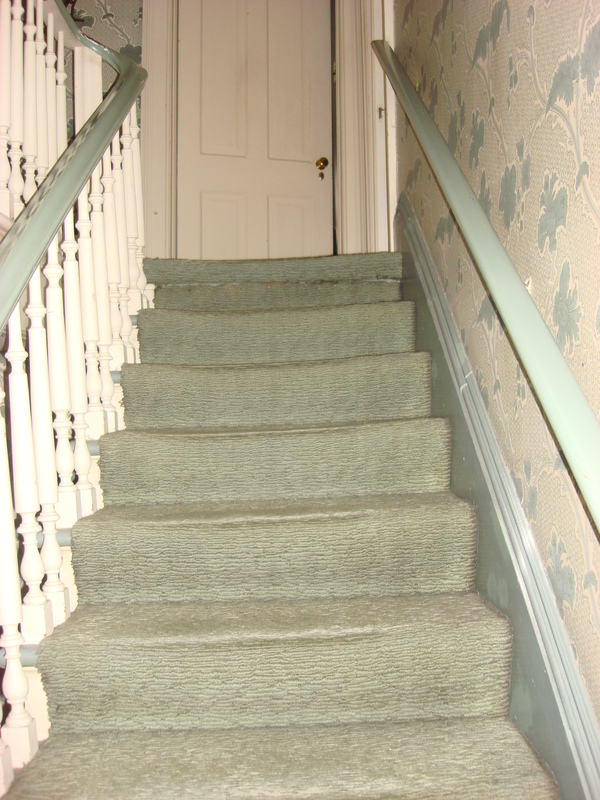 cracks in the plaster ceiling, carpeting that was older than you and me put together and a stairway banister that always leaned a little too much. There were some major dips in the floors where the whole placed had settled years ago. So much that they had cut the doors on the top just to get them to close into the tilted door frames. The bathrooms were in decent shape, with some unique tiling but the plumbing was 80 years old galvanized pipes that were closing up. At one time the house had been a duplex and had two stairways leading to the upstairs. When they combined the two residences into one they took some walls down and reconfigured a few rooms. I’m sure they didn’t do things to code and there are some ceiling and floor spans that are beyond what their limits should be. Closets were small and oddly configured and the hallways were narrow too. With all that in mind and after watching 20 episodes of “Holmes on Homes” on HGTV, I decided it was best to do it right and take everything down to the studs and start over. So in the fall I started ripping out carpeting and taking down walls one room at a time. 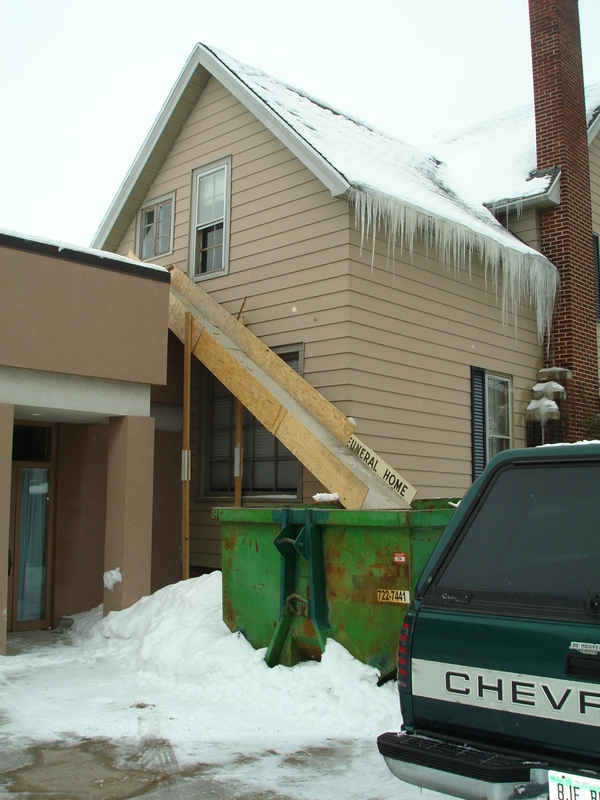 I’d haul/slide the stuff down the stairs and outside to the regular dumpster (distance of about 200 feet). I’d do the work when we were slow or on my days off. I even hooked up a pulley system to drop stuff out of the window in buckets. (I knew all those plastic cat litter containers that I saved would come in handy one day.) After a couple months of that I realized it would take me year just to get it down to the studs working that way. That’s when a few foolish friends said they’d help if I would just schedule a couple days and get a big dumpster. So I thanked them profusely and kissed their toes and promised them a special place in heaven when this was all done. (Beer at the end of a hard days work was also an incentive). particle board and used a bunch 2×4’s from the walls I had already taken down and built a 24ft slide that ran from the 2nd floor window down into the 15yard dumpster. I used the pulley system and a couple helpers to get it up and into place, power nailed some legs on it and I was ready to go. So for two weekends I got a couple of young strong guys to work for me and we ripped the whole place apart and got 95% of all the plaster and lath down and filled two dumpsters. It sure beat hauling that stuff down the stairs. But I had to do a fair share of dumpster diving to organize all the demolition stuff to make sure I got full use of the whole dumpster. Now that I can see the whole space it’s time to get some construction folks in there and tell me what I need to do get the floors level, the ceiling supported, the air handling vents in the right places and the plumbing planned out. And then the hardest of all, getting my wife to understand the mechanics need to be worked out first before she starts making the decorating decision. She’s already got a whole stack of magazines with sticky notes marking the stuff she likes. I’m afraid to look. I’m planning on moving back into the funeral home this year. That’s kind of backwards from a lot of other funeral home owners who start out living at the funeral home until they can save enough money to get a house of their own. But for me it makes sense both financially and business wise. You see, my daughter’s more than halfway through college, we have a cottage in South Haven (it was my wife’s place before we got married), a house in Norton Shores, and I figure I’m at the funeral home nearly 12 hours a day anyway I’ll probably get more time off if I live there. And if I live there I can be more attentive to the building and customers instead of traveling back and forth all the time. But there’s more to the story than that. 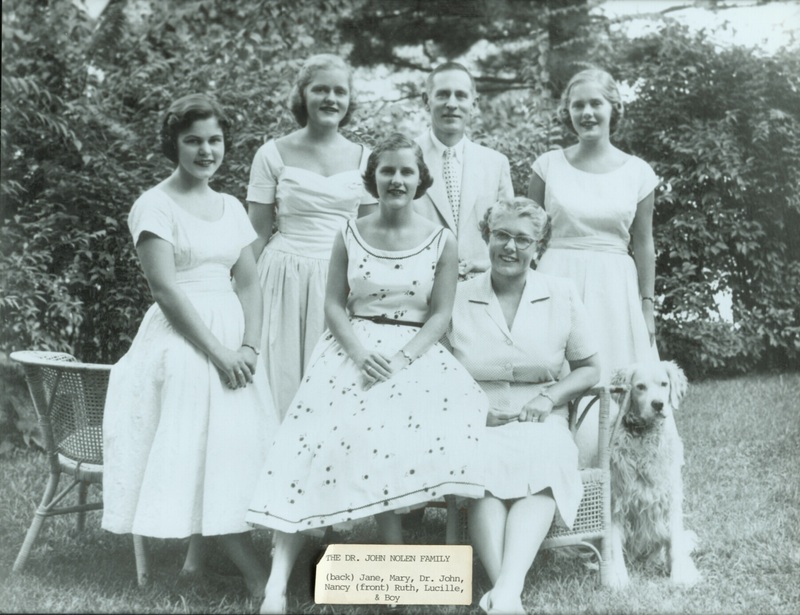 Twenty-three years ago the funeral home purchased the house of Dr. John Nolen, DDS and his dentist office. 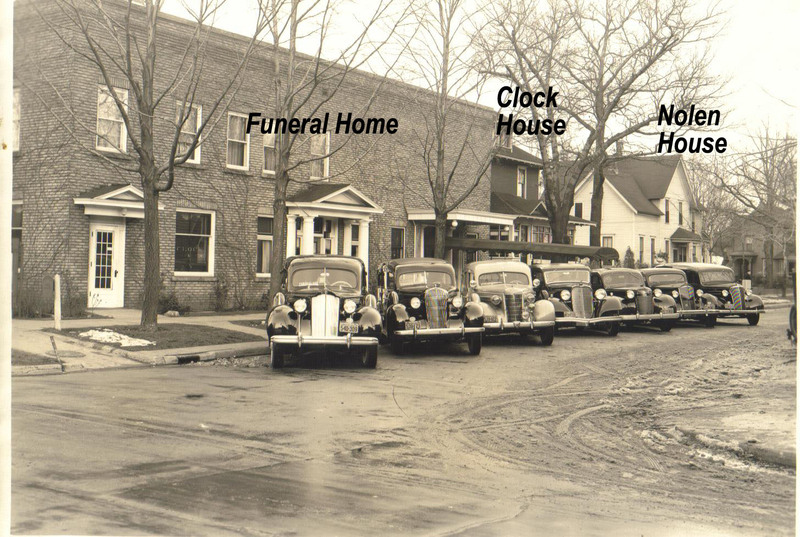 Dr. Nolen lived next door to the funeral home and his office was right next door to his house. Our property surrounded his house and we were good neighbors. He raised his family of 4 girls there during the 1940’s and 50’s. The house I grew up in (the same house my father grew up in) was next door to his, around the corner. My house was attached to the funeral home. I lived there with my folks and sisters until a fire in 1979 forced us to tear it down. 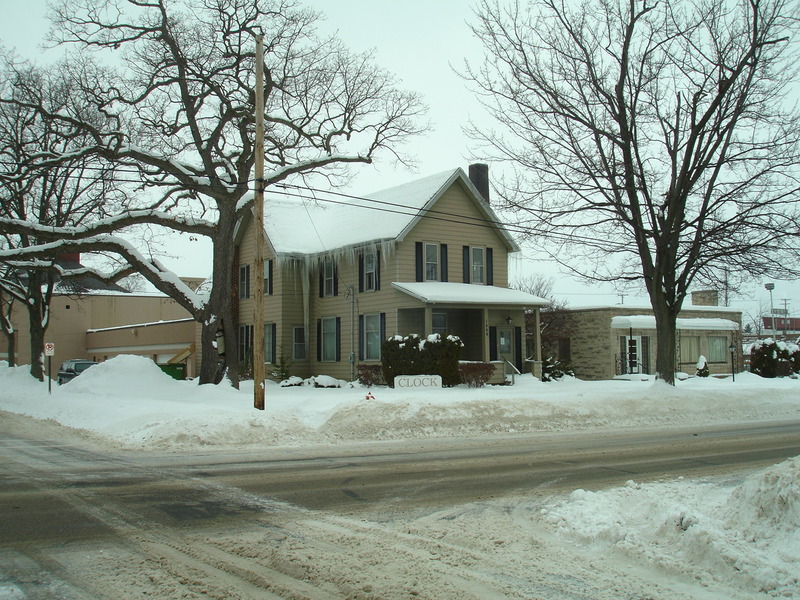 After Dr. Nolen died in the late 1980’s we purchased the home and his office building from his family. We expanded our building and attached to his buildings. We converted the Dentist office into office space for the funeral home staff and converted his house into our Family Center where we held receptions after the funeral. 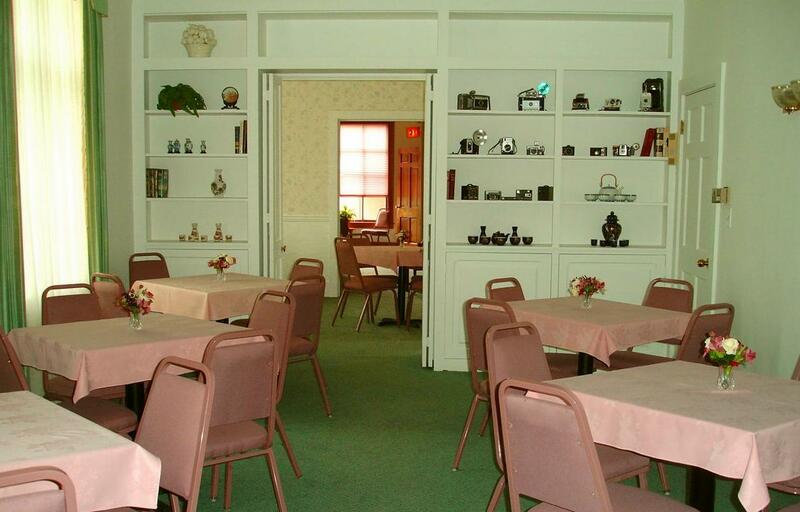 For nearly 20 years we used the Nolen house for receptions. It is a big 100 year old house. Five bedrooms and 2 bathrooms upstairs. Living room, dining room, big kitchen, wood paneled library, fireplace, study and 10ft ceilings on the main floor. 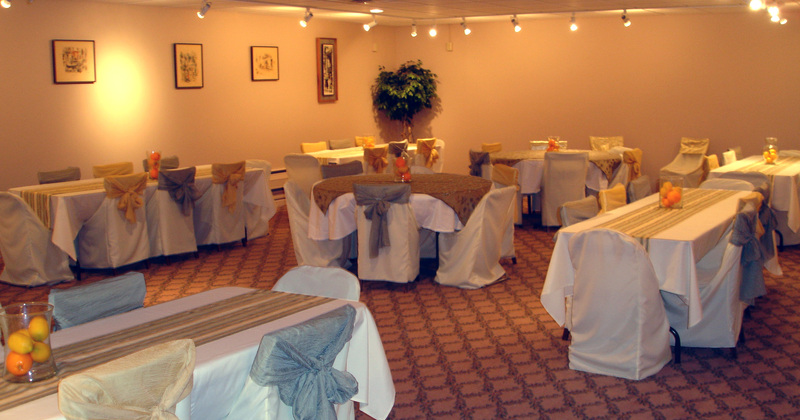 We put in small 4-top tables and chairs on the main floor to give it a homier feel (as opposed to 8 ft banquet tables packed into the room like a VFW hall). We could handle 75 people comfortably in the space and it worked great for that time. For years the upstairs sat empty, but eventually one of our housekeepers moved in to the upstairs. It was old and creaky up there. 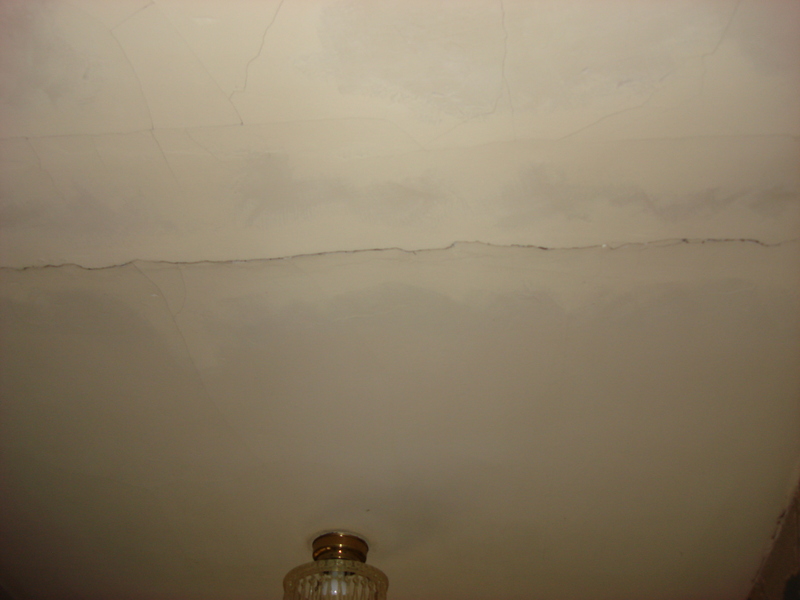 The carpets hadn’t been changed in years and the plaster was cracking, the floors sagged. Kathleen cleaned it up as best she could and made it very livable for herself and occasional visiting grandkids. We also had two apartments above the older section of the funeral home. For as long as I can remember one apartment has been occupied by a staff member. They came and went through the years and made some modest decorating improvements. 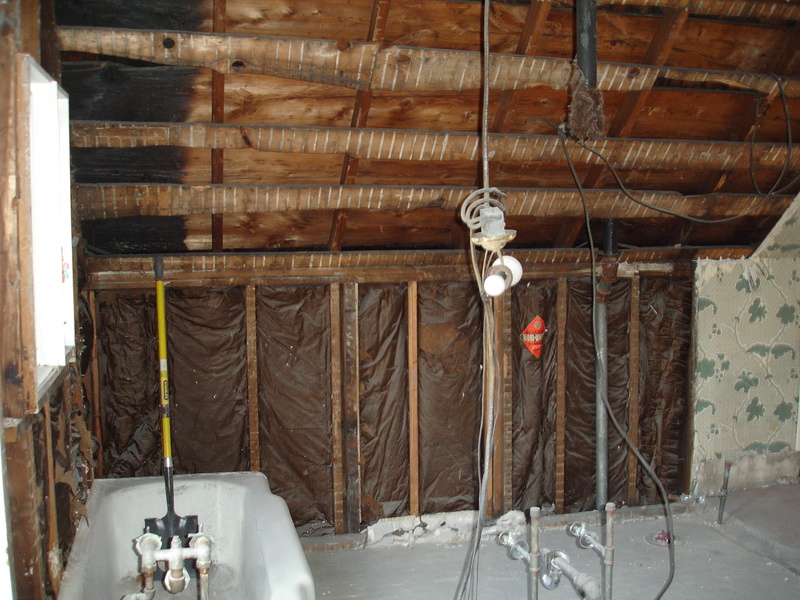 The last few residents had not taken care of the space very well and it was in need of a major overhaul. The other apartment, we called it the Dorm, had been used as the employee lounge and had two bedrooms where the staff had stayed when we ran ambulance service or had the on call duty. This was before the days of answering services, call forwarding or cell phones and somebody had to stay at the funeral home to answer the phones. The dorm sat empty for a number of years after we moved the lounge to the remodeled dentist office and shifted our casket showroom to the main floor of our original funeral home building. 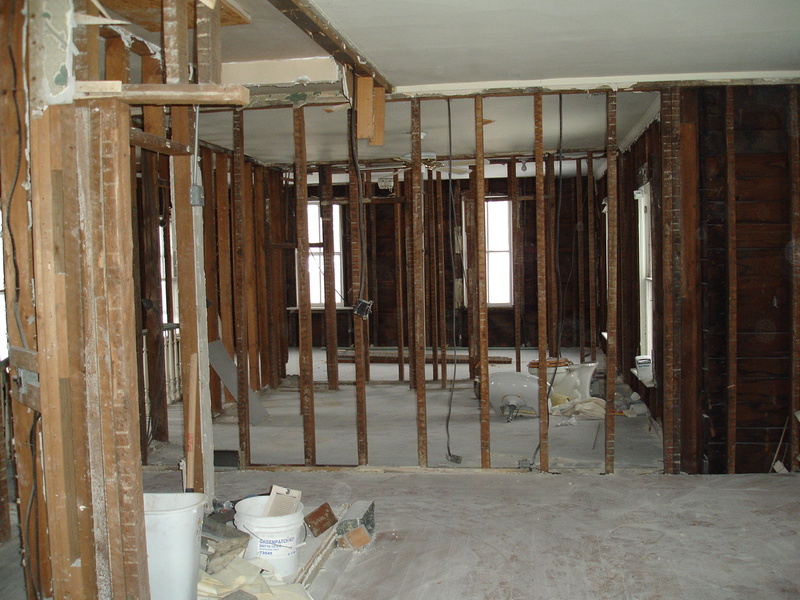 So a few years back I started doing remodeling projects. First, I fixed up the old dorm back into an apartment so an Apprentice could live there. Then last year I rehabbed the other funeral home apartment. I replaced plumbing, redid the bathroom, fixed the cracks in the plaster, painted the whole place, hung new ceilings, had new carpet installed, and did a complete overhaul of the laundry room. I did most of it by myself and I loved nearly every minute of it. Once that was done we moved Kathleen from the Nolen house into the apartment and I started planning the rehab of the Nolen house. Over the last few years we had also done some changes in our casket showroom. We had downsized it from a large complete store to a smaller, more compact display room using slatwall, partial caskets and video displays. We then converted the old showroom space into a larger, more open reception area capable of handling 125+ people. For a time we offered families the choice of using the new reception area or the Family center in the Nolen House. The new space was the big winner and the Nolen House family center ended up sitting empty. That’s when my wife and I decided we might as well move back into the funeral home and make the Nolen house our residence. That’s some of the back ground. More than you probably wanted to know. I’ll continue with the story in the next entry. It’s winter. So far this year it hasn’t been too bad. The snow blower is working and we’ve got a full supply of ice melt. We’re used to snow here in Muskegon. Being located on Lake Michigan gives us lots of lake effect snow through out the season. Usually it’s the light and fluffy stuff that pretty easy to clear away. But we still need to shovel and plow it. Fifty years ago, when my grandfather first built a parking lot for our funeral home he put a brick wall around the lot. We are located in a residential neighborhood and carved the parking lot out of the middle of the block so I’m guessing the wall was a way of keeping the neighbors happy or some city code thing. Well when you put a wall around your parking lot it makes it tough to plow the snow away. You end up making huge piles that eventually take up lots of parking spaces. That’s OK if you’ve got an over abundance of parking spaces like Shopping Malls or WalMart. But we only have about 65 spaces and we need everyone of them. So my grandfather and a plumber friend of his designed a snow burner for our lot. It’s basically a pit in the corner of the lot that’s 4 feet deep, 4 feet wide and 12 feet long. 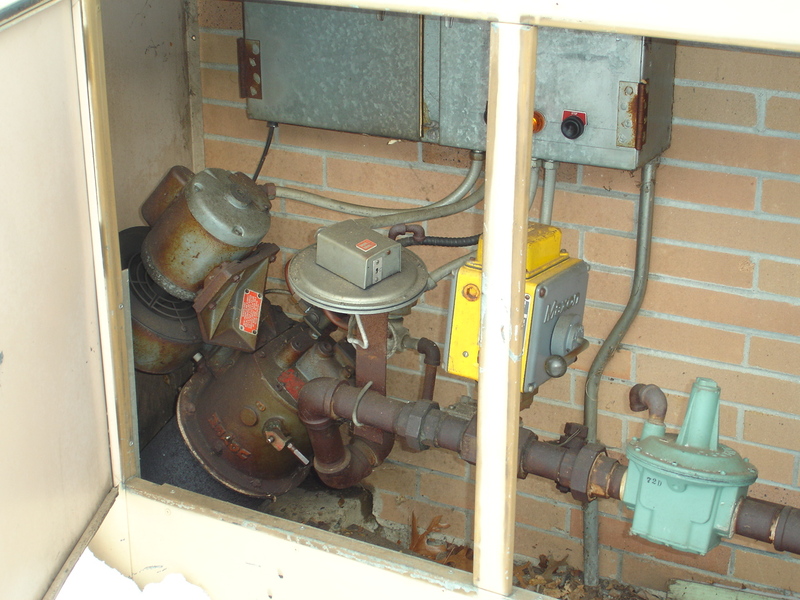 There is a snake of 6 inch pipe at the bottom of the pit that is attached to a gas furnace and blower. There is a drain at the bottom of the pit attached to the storm sewer. 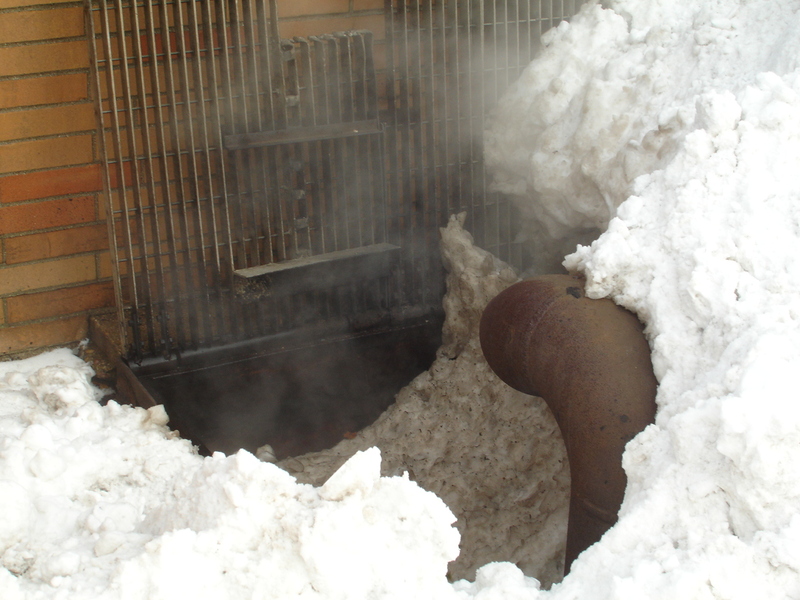 We plow the snow into the pit. Turn on the Burner and it melts the snow. Sounds simple enough, doesn’t it. Well it works pretty good, but it’s not magic. The snow doesn’t instantly disappear. So we end up having to “work the pile”. As the pile hollows out underneath we poke at it with a shovel until it all caves in and melts. Our snowplow guy, Ed, who’s been plowing our lot for over 25 years, comes back a couple times a day after a good drop of snow and plows a next section of the pile into the burner and we go through the same process until the pile is gone. Working the pile is sort of a rite of passage at the funeral home. When we would get someone new, usually a college kid or an older part-timer, one of the veterans would take them out there and show them the finer arts of whacking away at the pile to get the biggest chunk to fall down into the burner. It could be a little dangerous too when it got icy. But you really weren’t a veteran until you forgot where the edge of the pit was and put one leg into the water up to your thigh. You only did that once and you never let it happen again. 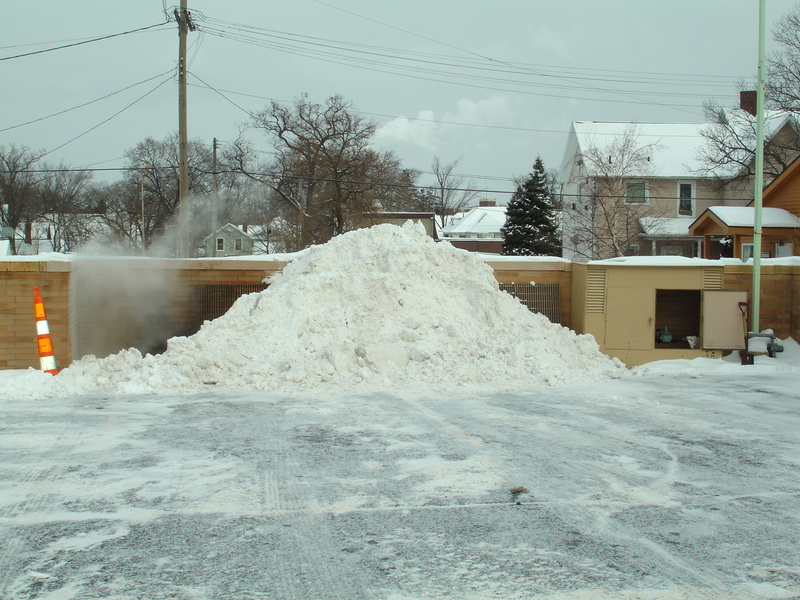 When we first put it in, there were several other business around town that installed their own snow burners but they all eventually abandoned them because you do have to work the pile for them to be effective and they just didn’t have the manpower to do it. But for us it continues to make financial sense. I spend a couple hundred dollars in gas and electricity through the winter to melt all the snow. If I had to have it hauled away with front-end loaders and dump trucks it would cost me $750.00 several times a winter. In the last 25 years I’ve only had to have the snow hauled away 3 times when we would get a big dump of wet snow and then the temperature drops and the pile turns into a big block of ice. So when ever we get visitors from down south I have to show them the burner because they just can’t believe that we have to do that.